Why are Some gun owners so against Common Sense when it comes to rational gun ownership? I support the 2nd Amendment, and one’s Right to Bear Arms, but I also support being properly trained in the care and feeding of a firearm. Hunters understand that without proper visual signals (orange vests/hats) that they could inadvertently shoot and wound/kill another hunter. One who shoots targets understands the concept of proper handling of their handgun/rifle as well. Why do we have to license hairdressers? or Real Estate Agents? or Register to Vote, and not Register or license those who would bear arms? Admittedly, it is a small percentage of the gun owning public act criminally or irresponsibly, just as it is not the majority of NRA members who are making the organization look like a gathering of madmen. So, I ask you Sane Gun Owners, without resorting to talking points, or Godwin or other myths, why Gun control for African-Americans (The Mulford Act, which was Supported by the NRA, and signed when Ronald Reagan was governor of California) and not for Whites? Gun advocates have been taught by the NRA that gun laws infringe on the Second Amendment. That gun rights are an inherent part of our nation’s gun culture. And that gun control is a modern-day liberal cause. Turns out, none of that is true. Our country has regulated guns since its earliest days. The Founding Fathers, frontier towns in the Wild West, conservative hero Ronald Reagan and, for most of its history, the NRA all worked to control guns, according to Adam Winkler, a law professor at UCLA. Individual gun rights were tightly restricted, with NRA support, until the past few decades. Winkler, author of the book “Gunfight: The Battle Over the Right to Bear Arms in America,” spoke to Star-Ledger editorial writer Julie O’Connor about the NRA’s former advocacy for gun control, and how its members got sandbagged by a bunch of zealots. 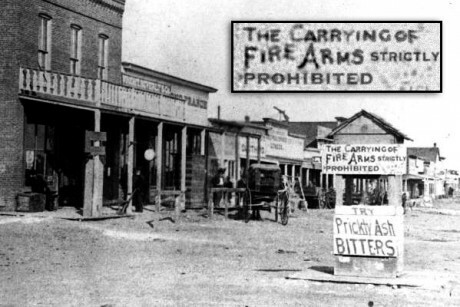 If DODGE CITY had a strict gun control law…. Next postWant something fun to do?